Many animals live near corals. Corals provide food through the food chain they support. 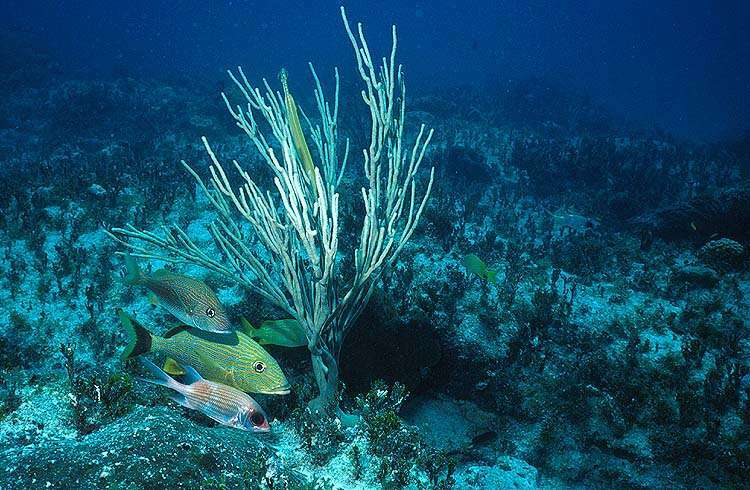 Corals also provide shelter from predators and from ocean waves and currents. This picture shows a single Sea Rod Coral colony growing from a sand and coral bottom near Rainbow Reef. This single colony was only 3 feet tall, but there are five different kinds of fish using this coral as a shelter. The large fish with the yellow and black tail is a Blue-Striped Grunt. The red fish in front of it is a Squirrelfish. The striped fish above it is a White Grunt. The small yellow fish with its head behind the stalk of the Sea Rod Coral is a French Grunt. Look closely, and you will see the long, slender, yellow body of a Trumpetfish hiding among the branches of the Sea Rod with its tail pointed almost straight up. These fishes form a mixed-species school. Like a school of fish containing fish of the same species, the fishes in this school help each other keep watch for predators.